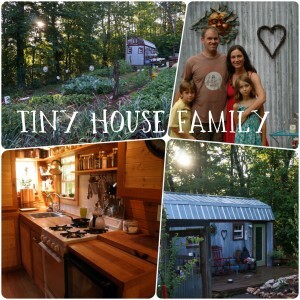 This is the second interview in my tiny house families series. Thanks, Korie and Alex, for sharing a peek into your home and family. Click any image below for a closer view. We are Alex and Korie and Abel (our five-month-old son.) We live in an 8×18 tiny house on wheels. I work full-time as a teacher (but I am becoming a stay at home mom soon!) and Alex works part-time at a tool and die shop. We purchased our tiny house prebuilt in October 2014. The house was built by a woman who planned to live in it herself, then decided that it was too small. The house is 8×18 with a 3×8 storage loft over the door and a 7×8 sleeping loft over the bathroom/kitchen. The front door is on the short end of the house and opens to the living room. The right side of the room has shelving and coat hooks, followed by a Pack and play/changing table, a counter top, and a closet. The left side is lined with a desk, shoe storage, and a 7 ft long couch. The back of the tiny house has an L-shaped kitchen next to the bathroom. Our sleeping loft is accessed by a ladder and has a king sized bed and some clothes storage bins. Our house is parked on a family member’s property. We share a semi-finished garage, which functions as a workshop, greenhouse, storage area, laundry room, and holds a deep freezer. How many sleeping areas do you have? Abel sleeps in his pack and play on the first floor, and we sleep in the loft. Sometimes we cosleep. This summer, we plan to build a composing toilet outside and to convert our bathroom into a bedroom for Abel. How did you build in privacy for yourself and your son? Hopefully having a bedroom will give both him and us more privacy! Abel is 5 months old. Describe a moment when you felt total contentment in your tiny house. I recently informed my employer that I won’t be returning next school year. Soon after that, we found out that Alex may not have full-time work available to him where he works now and his hours may be reduced. For most people, this news would put them in a tight spot. But when we found this out, I only felt freedom. We paid off our debt last year and our living expenses could be very low if we needed them to be. It made me so happy to have made the choices we did. Describe a moment when you felt like you might explode in your tiny house. Maybe this is a “first time mom” mistake, but I had this idea that Abel would get used to his environment, especially with sleeping. I thought that if he got used to sleeping with background noise, we could be moderately loud in the house and it wouldn’t make a difference. Maybe this will prove to be true when he is 2 or 3, but right now, he is a very light sleeper. We’ve recently figured out that he has food allergies and pretty bad eczema which has been preventing him from sleeping well. The other day, I was trying to put the baby to sleep while Alex did the dishes. The kitchen was a disaster since I had done a lot of cooking that day. Abel was crabby because his last nap was too short. Every time Alex made a noise in the kitchen, Abel would open his little eyes and start whining. I was so frustrated. I just wanted to go lay down upstairs and relax, but I couldn’t. I got really mad that we didn’t have a proper bedroom with a door for the baby. When we lived in our tiny house, we had to develop daily routines to maintain an orderly home and therefore our sanity (though we lost our sanity often, but that’s another story.) What sanity-saving routines have you developed specific to your tiny house? Prior to having a baby, our rule was to put everything away immediately. After having a baby, that wasn’t so practical. Now, we have a dump spot. In a tiny house, all space is needed. We designated an area to place things before putting them where they belong. We have a counter across from the couch that we are supposed to use for eating, but really, we eat on the couch most of the time. This counter is the place where we put things before dealing with them. For example, I might throw one of Abel’s blankets there while I change him because I don’t want to fold it and put it away when I will need it again in 15 minutes. I’ll put the diaper bag there if Abel is crying and restock it after he has calmed down. Otherwise, those things end up on the couch or in the middle of the floor, which can easily get in the way of the other person in the house. How important is solitude for you? How do you find time to be alone? Solitude is important to us. One thing that I like to say if people question how we can manage with such little space is that of course I need more than 144 square feet to live my life… I just don’t need to own it. Going for walks, working at the library, and long car rides are the ways we manage to get alone time. Also, headphones. They go a long way. Relationships with stuff—how has your relationship with stuff changed and what techniques can you share to stay on top of clutter? My relationship with stuff has changed in two ways. First, I’m more willing to invest in quality items. We have the Stokke Tripp Trapp Chair that functions as a high chair, booster chair, and eventually, an adult chair. Second, I’m not afraid to buy items and then get rid of them. I enjoy shopping, especially at thrift stores. I have no issue with getting a shirt for $3, wearing it for 2-3 months, and donating it back to goodwill. The biggest thing we do to stay on top of clutter is to purge every 4-6 weeks. 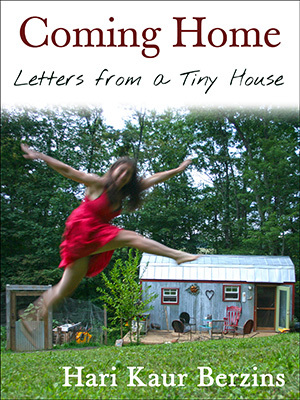 Have you noticed your relationships with your spouse and/or your children changing as a result of living tiny? We moved into our tiny house when we got married, so we don’t have anything to compare it to. I think this is a good thing. One thing that I know being in a tiny house has taught us is the importance of communication. Every single thing we do affects everyone else who lives here. One time, Alex agreed to clean the kitchen while I went grocery shopping. When I arrived home, he hadn’t cleaned the kitchen. I couldn’t put the groceries away AND I couldn’t make lunch. Small things like this become a big deal in a small space. How do you deal with cabin fever—say it’s snowing or raining, and outdoors aren’t an option. I try to have a good attitude, but if I get really desperate, I start house shopping. Then I think about how expensive they are. So I pull out my calculator to see how much money we would need to make. And how I couldn’t be a stay at home mom. Then I look at our bank account and think about how much money we’re saving. Then I’ll google about the plight of student loans for our generation and pat myself on the back and congratulate myself for paying them off. Then I’ll look at the weather report and hope the rain is stopping soon. By then, I’ve usually killed an hour or two and moved on. Just being honest! I miss having a bath tub. I also miss being somewhere that I don’t hear the baby. It can be hard to turn off “mom brain”, and physically leaving the house (especially in winter) isn’t practical when baby will need me again in 15 minutes. What are your long-term plans? How does your tiny house fit into these plans? At first, we had planned to buy land and design a small house to live in long-term. We decided that we like living in town. We plan to buy a small fixer upper (under 1000 sq ft) and gut the interior to make our dream house. While we love being debt free, we will likely get a mortgage when we buy a house, but plan to pay it off in 5-10 years. We plan to keep the tiny house to use as a guest house, school room, or income property. What advice do you have for families considering the move to tiny living? Living in a tiny house is HARD with a family. You make sacrifices. The sacrifices are worth it though, at least to us. I think it’s really, really important to think about your goals and the best way to accomplish them rather than to romanticize the idea of a tiny house and finagle a way to make it happen. Downsizing is generally (in my opinion) a good idea for most people, but be flexible about what that will look like for you. Be willing to change, and prepare for the unknown. We didn’t buy our tiny house planning for a baby, but he has been a very welcome surprise! How have you found land to set up on? Are you close to work? Are you connected to utilities? Are utilities more expensive for you than neighbours? How do you deal with waste water? Great questions, Ted! I’ve invited Korie to answer. I’ll add these to my next tiny house family interview. Cheers! We park on our inlaw’s property. We actually chose to have a tiny house in part because we already had a place to park it. We are each within 30 minutes of our jobs. We are connected to water and electricity, which was quite pricey. Because we live in a cold climate, the water lines had to be buried 5 feet deep. Our electrical bill is high in the winter because we heat with electric. We have a composting toilet, and our grey water goes to a gravel pit on the side of the house. We don’t use much water intentionally. Thank you Korie and Hari. Did you need local authority permission to set up? Could you have sub-mained from your parents home and made contribution to their added costs? Are you able to avoid added land taxes on their property with this type of what we could term “Granny Flat”? I can’t imagine how ou fit the Composting toilet in or get enough head for it to work?